If you’ve been following my recipes, you know I like colour as much as flavour and healthy ingredients. Today I felt like having something with salmon and broccoli and wondered how I could make it special. Here is what I came up with and it was super yummy! Cook the rice according to instructions (mine said 20 minutes). Brush an oven proof dish with a little bit of olive oil, place the salmon (skins down) in the dish and brush the fillets with olive oil. Season with black pepper and herb salt. Cut the cherry tomatoes in half and distribute them over and around the salmon. Also brush with some olive oil. Place the dish in the oven for about 20 min (this may be a little more or less depending on the thickness of your salmon). In the meantime, cut the red onion into small pieces and the broccoli into medium size florets. Your rice may be ready by now, drain the water and keep it warm in its bag the pot. Steam the broccoli over boiling water or in about 2 cm of water in the pan for 5 to 6 minutes (so towards the end of the time for your salmon), keep it a little ‘al dente’. While the broccoli is sweating, saute the onion over medium high heat in a little bit of coconut oil, stir occasionally. When they go soft and translucent, add the rice and the goats cheese, season with pepper, salt and fresh thyme, you can drizzle some olive oil over it if you like. When the broccoli is ready, add it to the rice and carefully mix it in. 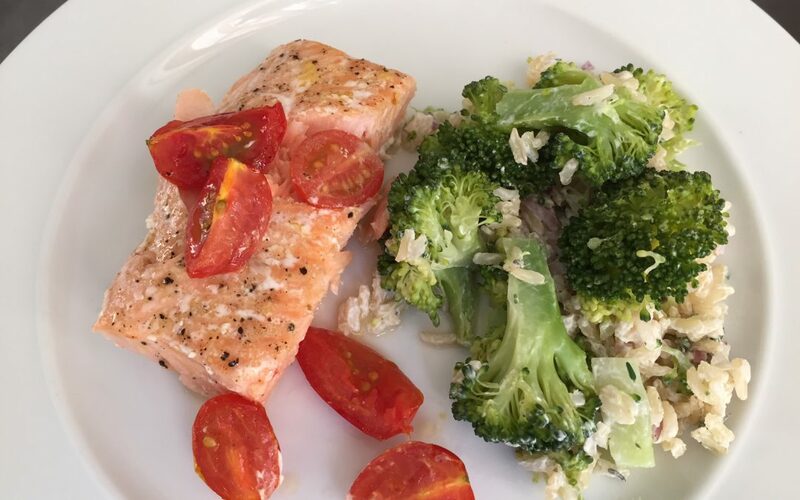 Arrange a piece of salmon with some of the tomatoes on 4 plates and spoon the broccoli rice next to it.